As we have seen before, low Earth orbit is full of space debris, with close to 10,000 complete satellites and rocket upper stages and some 110,000 pieces of spacecraft larger than 1 cm (0.4 inch) hurtling around our planet at orbital speeds. Without any precautions, the space elevator ribbon could be hit by such a relatively large piece of debris once every couple of hundred days. These collisions could well damage even the space elevator's superstrong fibers. Fortunately, objects larger than 10 cm (4 inches) in diameter are tracked by ground-based radar. With a mobile base on Earth, a space elevator could dodge such large pieces of which the orbits are well known; 10- to 20-km (30- to 60-foot) movements of the anchor point are expected to be needed about every 6 days. This still leaves a space elevator vulnerable to impact by dangerous pieces of roughly 1 to 10 cm (0.4 to 4 inches) in diameter, which can instantly damage a carbon nanotube ribbon but are too small to be tracked by radar. However, the shape of the ribbon Edwards foresees, which is wide and thin, makes it resilient to small holes. Any holes may be patched over (although it is not yet clear how to do that for nanotube fiber material that has not even been invented yet), or discrete cable segments could be replaced. In the worst case, the entire damaged ribbon could be substituted by deploying a new tether alongside it. Impacts of very small pieces, like flakes of spacecraft paint or naturally occurring micrometeors, will not cause immediate damage but slowly wear out a space elevator ribbon. After a certain amount of time replacement tethers will thus be necessary anyway. The damaged tether may even be reeled back in or brought down by a climber for repair on Earth. Another impact risk mitigation action is to make the ribbon wider and increase the number of fibers in the zone of low Earth orbits, where the debris is most plentiful. That would increase the chances of a hit, but lower the risk that one could sever the cable entirely. The ribbon can also be curved like a curl or a strand of DNA, so that the chances of an object hitting it edge-on and cutting through its entire width are a great deal reduced. A fully developed space elevator as proposed by Edwards will furthermore incorporate many individual, parallel tethers. This also results in increased robustness, especially if the tethers are separated from each other by some distance (tether design and production are discussed in Chapter 7). Nevertheless, space elevator proponents generally see impact damage mitigation as one of the top critical challenges for the space elevator. A second highly important threat to the space elevator is the atomic oxygen present in the high atmosphere. Normal oxygen, in its relatively stable form, consists of two oxygen atoms bound to each other. At high altitudes the Sun's radiation is able to break the atomic bond, resulting in single oxygen atoms that are extremely corrosive. They can be found at altitudes roughly between 60 and 800 km (40 and 500 miles), with a peak density at around 100 km (60 miles). In 1984 NASA's Space Shuttle Challenger deployed a special research satellite, called the Long Duration Exposure Facility (LDEF). Part of its mission was to study the effects of long-term exposure to the space environment of various materials, for which the LDEF was covered with a range of samples. The Space Shuttle Columbia retrieved the spacecraft in 1990 and brought it back to Earth for detailed investigation. It turned out that carbon fiber and epoxy composites on the front of the LDEF, the part colliding head on with the atomic oxygen in the wispy upper atmosphere, were worn down considerably. If future tether materials based on carbon nanotubes and epoxy have a similar vulnerability to the atomic oxygen onslaught, a space elevator ribbon could be wearing down at rates up to 0.12 millimeter (0.0047 inch) in 10 years. That may not sound like much, but a sufficiently strong individual space elevator ribbon may only be a micron (0.001 millimeter, 0.00004 inch) thick and could thus be completely worn through in about a month! The tether would break much earlier, when its residual strength would drop below the minimum level required to handle the forces on the space elevator. The part of a space elevator ribbon flying through the atomic oxygen layers at the altitude that LDEF orbited will not be moving at orbital velocity, so the wear there should be considerably less. On the other hand, LDEF was not flying at the height with the highest atomic oxygen density, where there are two times more free oxygen atoms per cubic meter. These two considerations happen to cancel each other out, resulting in a worst-case space elevator ribbon erosion similar to what was seen for the carbon/epoxy material on LDEF. Fortunately Edwards and his colleagues have a solution: coating the ribbon at the vulnerable areas with a layer of gold or platinum a few microns thick. The LDEF experiments showed that these materials are unaffected by atomic oxygen and can thus form an effective protection. Making the carbon nanotube fibers a bit thicker in the atomic oxygen zones would also help. The most mass-effective solution will likely be a combination of the two protection measures. Edwards and his team have also looked at other potential threats to a space elevator, such as rough weather, electromagnetic forces, and radiation. Hurricanes are dangerous, but their impact could be minimized by lowering the ribbon's surface area for the first 8 km (5 miles), using a lower width compensated for by an increase in thickness to maintain the necessary strength. Locating the connection point on a high mountain can also reduce the aerodynamic loads, but severely limits the possible locations for a space elevator base and is not compatible with a mobile anchor station. Transporting construction materials and payloads up a mountain is also much more difficult than shipping them to a floating base station at sea. Lightning could potentially damage a space elevator, but locating its anchor station in a relatively lightning-free zone such as the equatorial Pacific near Ecuador would help a lot. In such areas lightning storms are rare and very limited in size and extent. The mobile anchor station could move the lower end of the space elevator out of the path of these storms. An additional protection may be coating the ribbon with a nonconducting material. 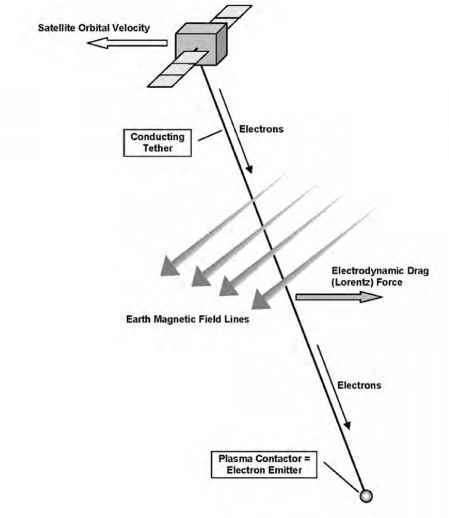 Electromagnetic forces in the space elevator ribbon (remember the electrodynamic tether principle) will not be strong enough to cause problems like with the shuttle's Tethered Satellite System, which burned through. Because the space elevator rotates with Earth, it does not move relative to our planet's magnetic field, which rotates together with Earth. The space elevator's speed with respect to the magnetic field is thus zero, and no electric currents are induced. The electrical charge of Earth's ionosphere in principle could result in currents running through a space elevator cable to the ground. However, because of the long distance and the relatively low electrical conductivity of the tether, these currents should be mild (the carbon nanotubes in the cable are superconductors, but the epoxy binding them together will not conduct much electricity). Radiation from Earth's Van Allen belts and the Sun does not affect carbon nanotubes, but could degrade certain epoxy materials. Careful selection of the applied materials should avoid problems in this area. Terrorist attacks are a concern, but locating the anchor station at a remote site in the equatorial Pacific and protection by military forces should minimize the risk that anyone would be able to severely damage a space elevator. In the case that the elevator cable does break for whatever reason, the uppermost part of the space elevator will drift upward for some distance (the closer to the base the cut occurs, the less the severed part goes up). It may then be possible to attach a mass to it, pulling the space elevator down and enabling reconnection to Earth using a new extension. Another option would be for the center station at GEO altitude to detach itself completely from the cable, cutting its connection to both the remaining segment of damaged tether below as well as the upper part that is connected to the countermass on top. Without any length of cable pulling it up or down, the station would remain in a stable geostationary orbit and could later be reattached to a new space elevator cable. While the upper part of a broken space elevator goes up, the lower segment will inevitably fall. In many older science-fiction stories the space elevator cable is a massive affair that, when cut, comes crashing down from space and leaves huge scars on Earth's surface. With a carbon nanotube ribbon, however, most of the lower part falling to Earth will burn up in the atmosphere, just like a reentering satellite. The lowest couple of thousand kilometers could survive the fall, but the paper-thin tether ribbons considered by Edwards would have a mass of less than 10 kg/km. They would therefore come down with about the same velocity as a falling sheet of paper, and thus would not cause injury to people. Nevertheless, being super-strong, the ribbons could be difficult to get rid of and could create a nuisance or even result in dangerous situations. It may therefore be better to have broken ribbons fall into the sea rather than on inhabited areas. What happens if passengers accidentally fall off a space elevator? Not much, if it happens at the geostationary point, because they will be in a circular orbit moving at the same speed as the space elevator. They might slowly drift away, but with a simple rocket system like those already incorporated in modern astronaut space suits they could easily fly back to safety. If they get detached lower down the space elevator, they do fall, but not vertically as is the case in a fall from the roof of a skyscraper. Their horizontal velocity ensures that they would enter an elliptical orbit, with the apogee at the altitude at which they became separated from the cable. The critical issue is then the height of their orbit's perigee. If they fell off below an altitude of 23,000 km (14 miles), they will be in trouble because their orbit will intersect the atmosphere sooner or later, and they will inevitably reenter (i.e., burn up). Falling off between this critical altitude and the geostationary point, they enter a stable elliptical orbit that brings them back to the starting point one revolution (and less than a day) later. It would not do them much good because the elevator would not be there when they get back, but they might be rescued by a spacecraft dispatched from the space elevator. Detachment at altitudes above the geostationary point means that the passengers are slung into an elliptical orbit, with the perigee located at the altitude at which they fell off but with an apogee that is higher than that, and with a period of 1 day or more. The higher up they disconnect, the higher the apogee. Above an altitude of 47,000 km (29 miles) they move off at a speed that exceeds the local escape velocity, and fly away into interplanetary space. Instead of accidentally falling off, it is also possible to intentionally release spacecraft. From the previous description it is clear that a variety of equatorial Earth orbits can be entered this way, and Jerome Pearson has shown that all the planets can be reached by launching spacecraft from the tip section of a sufficiently long space elevator.